A fun, scenic trip that begins at one convenient state forest campground canoe launch and ends at another, with light rapids at each as well, this is probably the most ignored section of the Bois Brule River because it lacks the historic boathouses upstream or the whitewater and Lake Superior finish downstream, but it’s a perfectly splendid paddle in its own right. We recommend this level. Wisconsin Trail Guide provides a very useful chart that categorizes water levels for each section on the Brule. 125-200 is the lowest you’d be able to paddle (although, expect some scrapping at the low end). Time: Put in at 12:20p. Out at 3:15p. Wildlife: Trout, blue-winged teals, deer, a bald eagle and several ravens. The most popular section of the Bois Brule is followed by the least paddled section. Why? Probably for no other reason than the two middle children are bookended by two completely unique paddling opportunities that accommodate any skill level. And with the third middle child being such an overachiever with its whitewater attitude and all – it’s no wonder, this shy timid one, is last pick. Indeed, this section is tame and flat(er) but that’s not neccesarily a bad thing. In fact, there’s an appeal in that to many. The put-in at the Bois Brule campground landing is pretty much a paddler’s dream come true. You can drive right up to it, unload your gear, park nearby and it’s an effortless gravel lead-in to the water. The only caveat is your vehicle needs a state parks admission sticker (which is true for the take-out as well, at the other state forest campground). The setting here is as inviting as it gets: crystal clear water, tall woodsy banks, small boulders, swift current, the beckoning call of nearby rapids. Once on the river, riffles and fun Class I rapids briskly whisk you past tall sandy banks lined by pine trees, an attractive stone wall, and then three bridges in succession 1.5 miles from the landing. The first and last are old railroad bridges, the middle is Highway 2 in the town of Brule. The latter of these is about 40’ tall and now part of an ATV trail. Eventually the current picks up again and will continue all the way to the take-out. These primarily are frisky riffles. The only notable rapid (still an easy Class I) is at the very end of this trip, about 40 yards upstream of the take-out, where the river makes a gorgeously sinuous S curve. This was a fun conclusion to a pretty trip. Much of the Bois Brule is a renowned trout stream, but perhaps the single most popular section for anglers is this trip. To begin with, there are several deep holes already in the river itself, and of the popularized paddling trips on the river, this is the least visited. But if you’re in no particular hurry, whether you’re fishing or just floating, then this trip makes for a great lackadaisical day on the water. Considering how superlative the other segments of the Bois Brule River are, this one is the most “ordinary.” (Bear in mind, however, that “ordinary” in this sense is very relative. While it can be argued that this trip is the dullest section of the Bois Brule, it is still prettier and more interesting than many other rivers in the rest of the state. It’s just that the other trips on the Bois Brule are uniquely engaging in a way that this one isn’t, or at least isn’t as much.) The many meanders do get a bit tedious after some time, and less experienced paddlers probably would have some difficulties in the various strainers. We cleared out one that beforehand was just a wall of tree limbs and leaves with no passage whatsoever. None of the strainers was unsafe, but they could be considered a nuisance, especially in a canoe. It wasn’t a particularly windy day when we paddled this, but the sound of the traffic along Highway 2 was constant for the first half of this trip – which is to say for 4-5 miles. In addition, you pass by a dozen or so houses on this trip, none the likes of the historic estates along the Stone’s Bridge to Winneboujou landings. Again, these are very minor “dislikes” in the grand scheme of things but for a river as vaunted as the Bois Brule, all of which is enclosed within 47,000 acres of state forest, these modern day distractions were a bit surprising. We knew that this trip would be the slowest and least interesting section that all the Bois Brule has to offer, so our expectations were pretty low to begin with. But we had hoped that the oft-mentioned “Meadows” area would have been more alluring. It’s pretty, to be sure, but not really anything to go out of your way for. One last word about the take-out. Like the Bois Brule Campground landing, the one at the Copper Range Campground extends directly from the river to a gravel lead-to. (We mention this because other official launches are not directly level with the water. 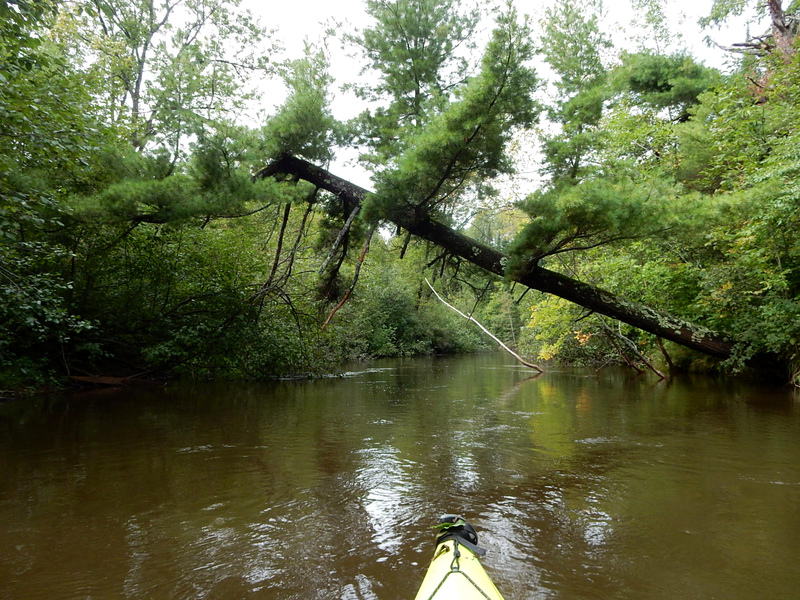 Some have raised banks, a platform pier, or rocks – all easy for canoes but a little trickier for kayaks.) But unlike the first campground, the one at Copper Range is not as accessible once you’re off the water. For one, there’s a steep series of staircases leading up a hill to the campsites. For another, unless you’re already camping at one of those sites, there’s really no place to leave a vehicle here. We were camping at Copper Range, which is why used this canoe launch to end this trip (and to begin an earlier trip a couple days before). But if you’re not camping at Copper Range, then it is advised to take out at the next access point, called Pine Tree Landing (also off County Road H), only half a mile downstream (plus you’ll be treated to a couple more light rapids along the way). Considering the allure of the other sections of the Bois Brule, returning to this one would be a tough sell. As we mentioned, it is very pretty in its own right – downright dazzling compared to the usual suspects in our own backyards in southern Wisconsin – but it’s definitely a B, whereas the other sections are all but flawless A’s. It’s a solid B, however. It would be interesting to see the landscape in spring, when carpeted in wildflowers, as well as autumn – even with the leaves fallen, the better to see the natural shape of the valley. The shuttle is pretty much a straight shot, but keep in mind that County Road H has no shoulder for bicyclists and the road itself is pretty rough (though paved). Well-marked landings – you have to appreciate that. The superb put-in at Bois Brule Campground. Campsites don’t get much better than this. Riffles and light rapids begin almost immediately. Fun section not quite a mile downstream from the put-in. One of a couple tall sandy banks lined by pine trees on this trip. The official boat landing at Highway 2 – better for canoes than kayaks. Former railroad bridge immediately downstream from Highway 2, now part of an ATV trail. After Highway 2, the landscape will look a lot like this. Cool fog that hovered just above the water during this trip. One of several obstructions (all negotiable without portaging) on this section of the river. A taste of the Pacific Northwest in the Upper Midwest. More Thoreau’s Walden than Ulysses S. Grant’s trout fishing estate. …And now with a passable clearance. Quintessential view of The Meadows section on this trip. Sometimes shrubs crowd in and make the river seem very narrow. And then other times the view is simply magnificent! The banks become taller, and the current picks up again, as you get closer to the next campground. Now it feels more wild again. The landscape is glorious the closer one is to the Copper Range campground. Something about this arching tree just caught my attention. And then the current picked up again! One last rapid just before arriving at the campsite landing/take-out. The Copper Range Campground landing (above which is a steep staircase leading to the sites). The take-out is in the middle of a beautiful S-curve in the river.